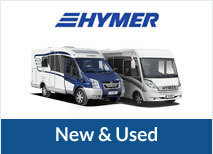 Driving safety has always been at the centre of Hymer motorhomes; just one of the many reasons customers return again and again. Right from the very beginning, at the development stage, there is a keen focus on all aspects of safety from the build quality, to the driving experience. Better road holding on difficult terrains means you don’t have to worry about where your travels take you and your spirit of adventure is never dampened. The driving technology on board means you will be free from skidding and sliding in your vehicle and mountainous areas are not out of bounds either as your Hymer is designed for long uphill and downhill stretches. The lightweight AL-KO frame with wide track provides a wheelbase which means weight is evenly distributed, making it stable and robust, yet still at a reduced weight. In the event of a ‘wheel slip’ (where traction is lost temporarily) the electronic braking is activated, so if you are setting off from partially covered ground e.g. moveable stones or gravel, then your ‘take-off’ is much easier with this technology. The ABS system stops vehicles from locking during an emergency, meaning it’s possible to steer yourself to safety if required. EBD (electronic brake pressure distribution) means braking is more controlled and the Brake Assist System (BAS) allows for emergency brake situations to be handled with precision; braking power is supplied evenly to both axles on the chassis when brake pressure is increased. At the front of the vehicle, there is a high panoramic window and side windows which allow for a very clear and extensive view of everything. Thanks to the electrically adjusted heated mirrors and wide angle mirror, there is no need to have eyes in the back of your head. The weather can take its toll on your travels at times but with Hymers, come three windscreen wipers, meaning there is a large clear view of the roads at all times.